Ubiquiti RocketM5 Outdoor BaseStation (2 Units). Featuring mix-and-match industrial design, the Rocket is a Ubiquiti Networks airMAX BaseStation that supports speeds of up to 150+ Mbps real TCP/IP throughput. It is ideal for deployment in Point-to-Point (PtP) bridging or Point-to-MultiPoint (PtMP) airMAX applications. The Rocket enclosure is built to survive harsh environments and fits the Rocket mount built into every airMAX antenna. Pair the Rocket with the appropriate antenna for your PtP link or PtMP network. The Ubiquiti Networks Rocket M5 MIMO airMAX BaseStation features enhanced radio performance and waterproof, durable construction. Its carrier-class capabilities provide speeds of up to 150+ Mbps. The M5 features Ethernet (10/100 Mbps) connection that delivers high throughput for reliable data transfers. The rugged enclosure is designed to improve performance in harsh RF environments and in volatile weather conditions. This version of the Rocket M5 comes with firmware that does not offer Dynamic Frequency Selection (DFS), which is a requirement for use in the U. Rocket radios and airMAX antennas have been designed to seamlessly work together. Every airMAX Sector, RocketDish, Omni, or Yagi antenna has a built-in Rocket mount. Ubiquiti Omni AMO-5G10 10dBi Dual Polarity MIMO Antenna (2 Units). The Ubiquiti Networks AirMAX Omni 2x2 Dual Polarity MIMO Antenna is designed to be compatible with an optional Rocket M BaseStation to deliver 360° wireless networking. This dual-polarity antenna operates under the 5 GHz frequency and offers a gain of 10 dBi. It delivers 2x2 MIMO performance and supports airMAX technology, which uses a Time Division Multiple Access protocol to send and receive data at pre-designated time slots. Ubiquiti has outfitted the antenna with a robust mechanical design that helps ensure outdoor survivability. Included along with the antenna are a pole mount kit, Rocket M bracket, and weatherproof RF jumpers to make your base station building experience easier. Pair the RocketMs radio with the airMAX Omnis reach to create a powerful, 360° omnidirectional basestation.. This seamless integration gives network architects unparalleled flexibility and convenience. 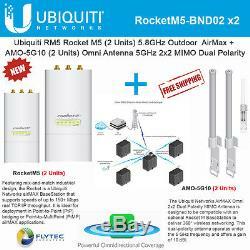 The item "Ubiquiti RocketM5 2Pack BaseStation PtMP +AMO-5G10 2Pack Omni Dual Antenna 10dBi" is in sale since Friday, June 9, 2017. This item is in the category "Computers/Tablets & Networking\Enterprise Networking, Servers\Directional Antennas".